We have yet another super simple paper craft idea to share with you, this time we are showing you how to make a paper peacock craft. Peacocks trully are gorgeous birdies, their colorful feather tail is really memorable! While peacocks are breath taking they can also be super duper loud. When I was a teen, my neighbours temporarily had a pair of peacocks. They were giving them a home while their big enclosure on a farm further away was being built. The time when those magnificent birdies were leaving near by were the times I had the most sleepless nights. Nothing could have ever prepared me for the loudness coming from such a (relatively) small animal. But one can get used to them too. Putting that aside and getting back to crafting. 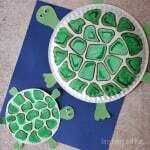 This fun craft idea is great for fine motor skills. Its a fun craft for preschool, but you will need to modify it a little bit – certainly use wider strips of paper and less of them. Peacock legs certainly don’t have to be as detailed if preschoolers will be making the project either. We do recommend using kid safe scissors to cut the strips of paper for a good scissor practice workout. Cutter trimmer isn’t a good option for younger kids, even if it’s secured (as ours is). Most kids in kindergarten will be able to do this project. You can have them use paper trimmer under adult supervision (not in a classroom setting). Always use your good judgement when crafting with kids :). 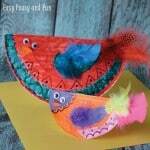 Older kids should easily handle this craft and can even take it a bit further by adding more details on the tail feathers (by decorating them beforehand with markers or adding yellow and blue paper). 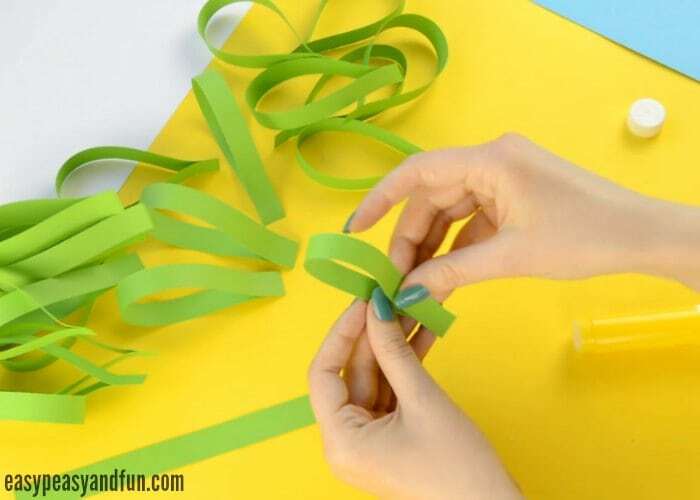 Start by cutting a whole bunch of green paper strips. We used a regular letter sized (A4) sheet and have cut it across the width. The width of the strips was about a “finger” wide. No need to be precise here, just make them as wide as you want – you can always change the size as you go. If you want now is the perfect time to draw some feathery elements on the paper strips (we think regular “feather marks” or zendoodle patterns will work out pretty great). 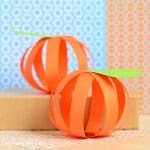 Glue the ends of the strips together to make a loop/teardrop shape. You will need a whole lot, well you can only have a few too, whichever number works for you as long as the project is fun. Younger kids might get a bit bored or loose the focus if there is too many loops to make. Older kids will be able to make more loops, the more loops the richer the peacock tail will look. In our opinion stick glue works out best when working with paper as it dries quickly and it does not wet the paper. The looping process might take a while. But it can be fun :). 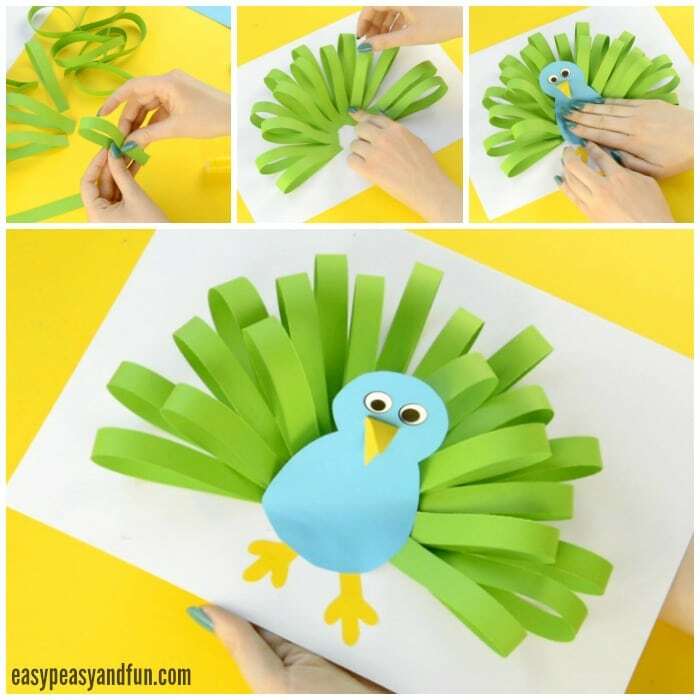 You can also glue yellow paper shapes on the loops to make it more peacock-feather like. Now Let’s Make a Peacock! Take the white background and start gluing the loops onto the paper. Make a half circle. We started at the outer edge and worked our way to the centre (we really recommend you check the video tutorial). Once you are happy with how your tail is starting to look it’s time to move to the (happy) feet. Cut two feet out of yellow construction paper and glue them on the base (at the center of the circle, a bit under). Younger kids can just cut the rectangle shape while older kids can get a bit more curvy. 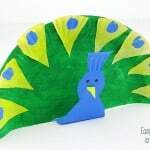 Cut the peacock body shape out of the blue construction paper (make an 8 shape). Cut a small triangle out of yellow construction paper and glue it to the head part. Stick on two wiggle eye stickers. Glue the body on the white paper, nicely push it on top of the tail. 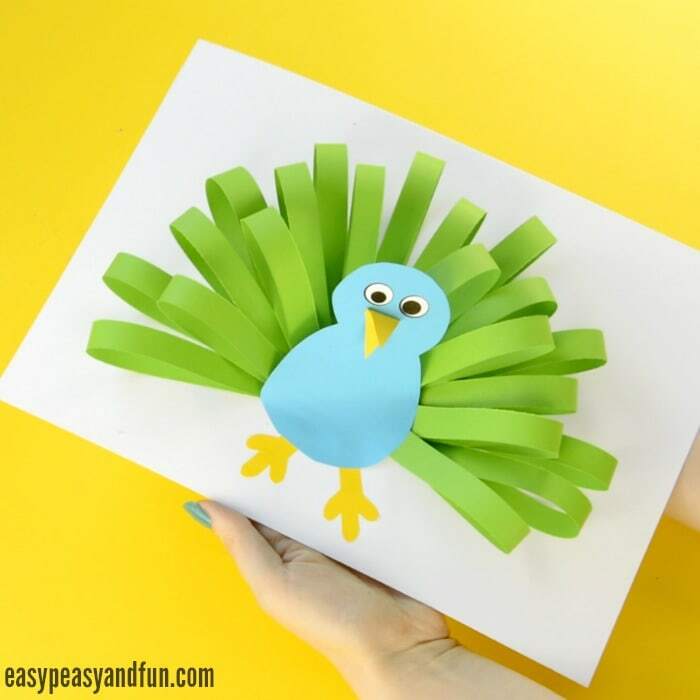 You’ve made yourself a nice looking paper peacock craft! Beautiful. I can’t wait to try with my students. My daughter is obsessed with peacocks. Today she was poorly and I was struggling with fun (and easy) things to do with her and I found your peacock post. She loved making it and it cheered her up too. It is also easy to make out of things that we already had lying around the house. Thanks!